We recently took our 2013 X5 into the service center with an engine malfunction-reduced power issue. We had the vehicle at another shop prior when the issue first occurred and got conflicting information on what they thought the cause was. Figured best to take to the dealership. The technicians at bmw escondido diagnosed down to the DME and then found that the part was on warranty. The customer service from the loaner department to our advisor was exceptional. Special shout out to Tanner Pierson who was our service agent and kept us informed during the entire process in this hard to diagnose issue. Car is back to normal and runs great now! 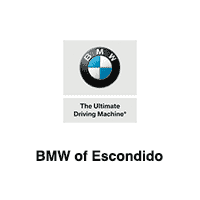 The Escondido BMW Team is top notch and utmost professional. They are nice, fast, expedient, and courteous...everything you want and expect from BMW services. Thank you BMW of Escondido. .
Hector is always very friendly and informative. He is thorough when checking what services are needed but does not push to get everything done as he is cost conscious. He provides detailed information and reviews diffent options in price and products so I can decide on what to schedule now and plan for the rest later. Thank you Hector. Ryan at BMW of Escondido went above and beyond for me at my experience with them this past weekend. Not only locating the exact car I wanted that was somewhat difficult to come by, getting me a great deal, but also making sure I had the best experience every step of the way until I drove off the lot. We even went for a fun test drive while waiting for my car to be detailed! BMW of Escondido made me feel like it was a pleasure earning my business. We went in to look at another new lease (since our 3 year lease was ending)...Chadi and Sales Manager Steve Kang were very helpful and NOT pushy like so many car dealers can be. They patiently answered all of our questions and after test driving a few, we decided on a new gas-electric hybrid. So far we couldn't be happier. They were able to work with us to get the most incentives available and even delayed doing the deal until they could all be processed and/or approved. What car dealer ever wants to delay any deal for the customer's benefit? This is our 6th BMW and by far the best experience we could have asked for! The showroom is very clean and simple (white walls could use some paint and decor) and no one there ever seemed high pressure...it was very relaxed. I've bought many cars over the years and will happily be coming back in the future to deal with these two fine gentlemen! Can you fall in love with a car dealership? I have - BMW of Escondido rocks!Peter is a great Sales Manager because- he personally answered my initial inquiry- he took the time to return my e-mails promptly and with attention to detail- he took responsibility for seeing that I was taken care during all steps of my deal- he anticipated my requirements and was ready with answers- he offered to deliver the car to my home. I have purchased a number of BMWs in my lifetime and this transaction was as good as it gets.Amanda is an exceptional Client Advisor who knows the product well. I was very impressed with her professionalism and enthusiasm, and for how she took care of me. Frank made this process so easy and helped me find the car I was looking for. Very friendly, easy to work with! Once I made my decision he had my new car ready to go so quickly. I didn’t have to spend my whole afternoon doing paperwork etc. I got to be out and about in my new car instead. Thanks Frank!